North Carolina waterfalls are primarily located on the western side of the state. The state has many waterfalls that are easily accessible either by car or by a short walk. Of course for the more adventurous there are difficult-to-reach waterfalls as well. Below is a list of North Carolina waterfalls that I have visited at some point. Each waterfall page will have detailed information (when available) and pictures. The detailed information includes my own personal rating, GPS location, topographic maps, hike detail, and specific waterfall photo tips. I also provide road directions and google map links. Also, now available is an online gallery of my finest North Carolina waterfalls. Below is a sample slideshow of these waterfalls. While not as detailed, there is additional information on other waterfalls in North Carolina that visitors have submitted. You can find this list near the bottom of the page. Did I mention videos as well? Here is a video playlist of North Carolina waterfalls. As a more visual reference for the waterfall listing above, here is a map of all the waterfalls. Click in the map to interact and get details. I love this tool! Waterfall-Picture-Guide is excited to now offer our own free android app (sorry i-people) that installs in seconds and gives you an on-the-go waterfall reference for finding and researching waterfalls near you. The waterfall database is searchable with mapping and navigation features. There are several states current in the database, including Tennessee, with more on the way. 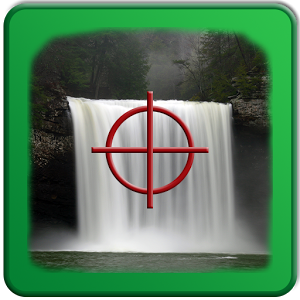 Here is the free waterfall finder app! You can also download the ad-free version here. Kevin Adams' book North Carolina Waterfalls: A Hiking and Photography Guide is highly recommended. This is the best waterfall book in my collection with detailed descriptions, photo suggestions, and ratings. He also maintains a website with	updates to the book such as newly discovered waterfalls and access issues. The Blue Ridge Parkway Daily has a listing of the top 10 waterfalls along the Blue Ridge Parkway, several of which are in North Carolina. The BRP is a great way to slow down and see a wide variety of attractions in western North Carolina. The Transylvania County tourism website,	visitwaterfalls.com, has a free downloadable brochure on the area with a map and description of many nearby waterfalls. Another good website is	North Carolina Waterfalls. Not the easiest to navigate but the photography is really good to go along with the commentary. The Franklin Chamber of Commerce has a	guide to 16 scenic waterfalls in Southwestern North Carolina along with a	waterfall map of the area. Submit Your Own Watefall Report! Have you visited a great North Carolina waterfall? You can submit a picture below along with a brief description of the waterfall and any other pertinent information. Our readers would love to know as much as possible! Just submit your waterfall picture. It's a snap. Your waterfall trip will appear on a Web page exactly the way you enter it here. You can wrap a word in square brackets to make it appear bold. For example [my story] would show as my story on the Web page containing your story. TIP: Since most people scan Web pages, include your best thoughts about the waterfall in your first paragraph. Do you have a waterfall picture to add? Great! Click the button and find it on your computer. Then select it.